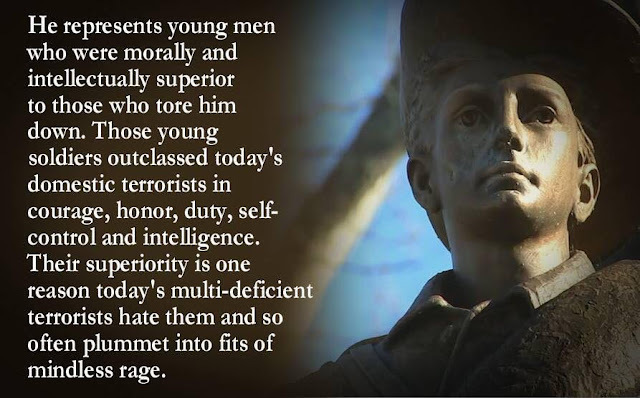 Fair disclosure: I harvested the attached "Silent Sam" from Mr. Townsend's estimable blog "Free North Carolina" because it so neatly captures the very essence of a personal theory of mine. Why is the Left so angry and violent? - Because somewhere, inside them, lurks the realization that they are inferior specimens, lacking in intellect, cowardly, and having neither a sense of honor or responsibility. So they hate, and try to destroy or tear-down anything and everything that reminds them of their deficiencies. - And they do this because it is easier for the stupid to demolish rather than to build, and it is easier to be against something than it is to be for everything positive and civilized about humanity. The Left will do whatever they can to avoid looking into the mirror and seeing their own impotence, depravity, and failure. - Like wounded beasts, they are dangerous to others and need to be taken seriously...and some of them 'put down' out of mercy.